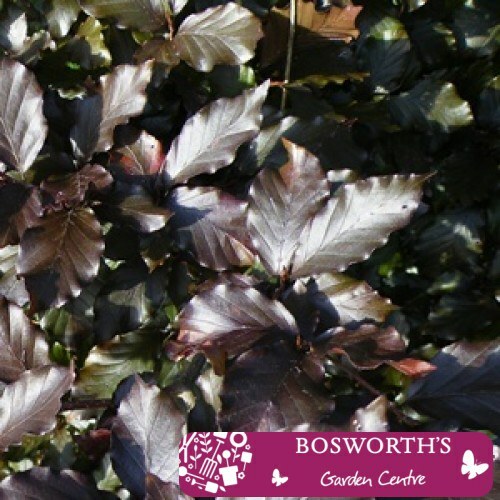 Bare Root Hedging - Purple/Copper Beech Fagus Purpurea (Single) - Similar in most respects to the green variety. Particularly versatile - ideal for formal garden hedges & country hedgerows. The fresh foliage is light green/purple in Spring, turning darker to a rich reddish purple during the Summer. Into Autumn the leaves will change to a golden yellow before turning rich copper in Winter. Although technically deciduous, beech hedges retain their leaves in winter enabling year round privacy, this is provided they are trimmed annually in late summer. Beech is not affected by salt spray making it an ideal choice for a roadside hedge. Will grow successfully in full sun or partial shade & in any reasonable soil as long as it is free-draining. Will tolerate exposed sites once established. Easily maintained.